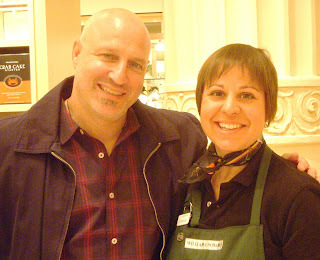 Tom Colicchio, famous judge and chef from Bravo TV's Top Chef, and the famous foodie of Craftwich, CraftBar and 'wichcraft came to WILLIAMS-SONOMA today for a book signing. I took the day off from the synagogue office job to work at the store and participate in the day's events. The event was not nearly as mobbed at the Martha Stewart event we hosted in October 2008, but our over-all day was a wild success. You could feel the buzz of electricity and anticipation in the air when you came into our store. The staff was hyped up and the customers (whew! customers, finally!) 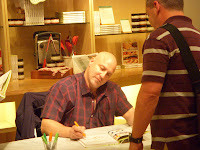 enjoyed our demonstrations, tastings and Chef Colicchio very much. I've been a fan of Mr. Colicchio's for years now - reading about him in the New York Times, following his restaurants and food creation progress avidly. I have to confess though, I don't watch Top Chef - as with several other food reality programs, I can't stand these shows. The reality isn't reality and what does ring true is so over-blown that it gives me agita. Occasionally these shows hit a nerve, reminding me of all the awful times in the professional kitchen business. The bottom line about why I dislike Reality Television Food Programs - they all glamorize life in the kitchen and frankly, it's not pretty in real life. It's a back-breaking and stressful profession in which to carve out a career. That's why I prefer to teach, do cooking demonstrations, take people on food tours with City Food Tours and write my recipes here. For today's event, I was asked to make something for our customers to eat. We were already featuring Tom Colicchio's panini from his new cookbook, using his 'wichcraft condiment, Caramelized Balsamic Onions on focaccia bread with Robiola Cheese. There were also crostini with his 'wichcraft tomato relish, and the Calphalon Rep was cooking chicken on the new grill pan with the Williams-Sonoma Chili Lime Rub. We had a Mango Margarita Cake and Mango Margarita Sodas. All that was left for me to make was something simple that incorporated the third 'wichcraft condiment - Green Olive Tapenade. Thinking outside of the jar, I decided to use the tapenade in a pasta salad; keeping it as simple as possible with few ingredients. I wanted the tapenade to be the main flavor of the pasta salad - but still have some fresh vegetables for taste, texture and colour. I was asked by our store managers to use some of the imported pastas we carry, to showcase our other products. The results were spectacular! I used two types of fancy shaped pastas, the green olive tapenade and I added shredded zucchini, cherry tomatoes, lemon zest and juice, olive oil, parsley, salt and freshly ground black pepper. Minimal cooking, minimal prep and lots of bright fresh flavor. 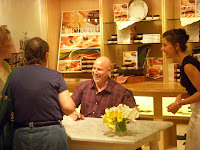 After Chef Colicchio finished signing books, he graciously posed for photos and chatted with the staff of our store. I missed getting into the group photo, so I asked if I could get a photo with him. We had a few minutes to chat and I told him how much I liked using his new food products and that the tapenade works well in a variety of ways. Unlike when I stammered and fawned all over the place at the Martha Stewart event, this time, having the chance to talk with a celebrity chef felt relaxed and natural. Mr. Colicchio - you truly are a Top Chef. Bravo! Bring a large pot of water to a rolling, rapid boil. Add in two tablespoons of kosher salt and then add in the dried pasta. Cook the pasta until al dente - or according to package directions. Drain, rinse and cool the pasta and set aside. Drizzle with a little bit of olive oil to keep it from sticking. Shred the zucchini either using the coarsest side of a box grater, or in a food processor fitted with the shredding/julienne blade. Add the shredded zucchini to the pasta. Cut the cherry tomatoes in half lenghtwise and add them to the pasta. Roughly chop the parsley and add it to the pasta/vegetable mixture. Add the entire jar of 'wichcraft Green Olive Tapenade to the pasta salad. In a mixing bowl, whisk together the lemon zest, lemon juice, 1/4 teaspoon of salt and several grinds of black pepper. As you are whisking, slowly drizzle in the olive oil in a slow steady stream. Taste and adjust seasonings. This dressing should be tart but not to acidic. 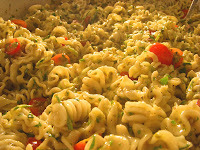 Pour the dressing over the pasta salad and gently toss to combine and incorporate all the ingredients. Taste and adjust seasonings, adding more salt and pepper as needed, and/or additional lemon juice. Chill the pasta salad before serving. Makes 8-10 servings. WOW!! I would love to meet him!!!! My husband and I are going to Vegas in August and plan on eating at his restaurant, Craft Steak. What an exciting day!!! It was so nice to meet you last week! What has happened to our Phillies?? ugh. I'll be there on Sat..hope they can turn it around.